!! Here comes the sun !! This is my final souvenir from New York. A couple days after the blizzard, perhaps Feb. 14, I was walking through Central Park and decided to pass through the zoo. 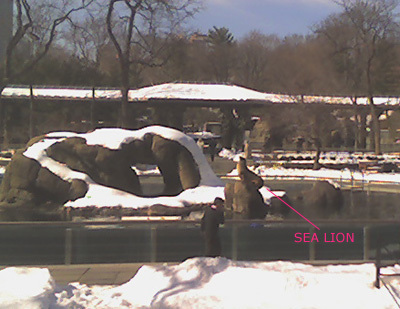 The Central Park Zoo is great because you can see the sea lion pool from outside the gate and don’t have to pay, though they are often just swimming in circles below the surface of the water. Well that day one of the sea lions was sitting up on the rock soaking up all the sun, and I think posing for us onlookers. He is one of the cutest animals in the zoo, matched in cuteness only by the penguins, the sea otters, and the happy family of red pandas (and the polar bear sometimes, except I find him kind of depressing, lying unhappily in the mud all day). « PREVIOUS ENTRY: Welcome to the new !! omg blog ! !